This special backpack is made from durable 1200D ballistic polyester fabric and is equipped with a large opening main compartment with rugged oversize zippers, adjustable side compression straps, a heavily padded back panel with Airflow ventilation technology, padded contour shaped shoulder straps with mesh fabric and built-in suspension. Unobstructed, ScanSmart lay-flat design helps speed through airport security by allowing laptop-in-case scanning through TSA X-ray machines. Side water bottle pockets, Side zippered large accessory pockets, Accordion file holder. Quick-access, front zippered pocket for frequently needed items. Reflective accent material built into shoulder straps for added safety. Padded media pocket with built-in headphone cord port. Front carabiner and web daisy chain. 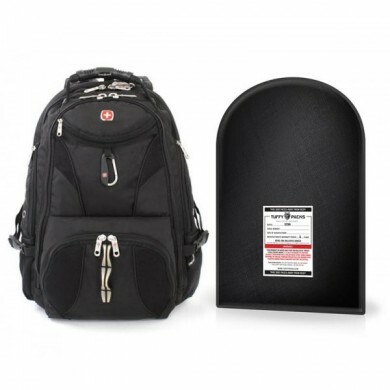 This specially designed Insert is designed to fit into backpacks and smaller day packs measuring 12"x16". This insert provides ballistic protection from handgun fire and can stop multiple rounds.